Remember Don Imus? 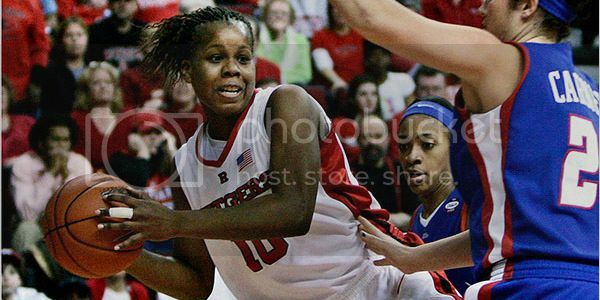 Remember how upset we were a few years back when the wretched shock-jock and his pals took to the airwaves to dis women of the Rutgers women’s basketball team, after they just missed winning the NCAA championship, referring to the black team members as nappy-headed hos? Remember how incensed our leaders were about that ugly comment and how, as a consequence of hurt feelings and damaged egos, we called for Imus’s head on a platter? Remember, also, what we said in our defense of the Rutgers women? You know, how those women didn’t deserve to be disparaged because they were, in the words of their coach, C. Vivian Stringer, “young ladies of class and distinction, articulated, gifted.” Remember how we rallied around those women because they seemed to stand for something we believe in — hard work, dedication, intelligence, uplift. Remember that, because they were, literally and symbolically, our daughters, sisters, cousins, friends and neighborhood talent we cheered on to victory, we did not want to have their images sullied by the likes of Imus and crew? Remember ever discussing whom the real nappy-headed hos were? The question is not meant facetiously, its answer has very real consequences. The Imus brouhaha, though it’s now several years in our national past, still resonates very deeply for certain communities of black people, and not just for the most obvious reasons. The real take-away of the whole debacle was not that bigotry is still alive and well in the early twenty-first century. We didn’t need Imus to tell us that. The legacy of the Imus incident is the way we responded to it. In loudly proclaiming the Rutgers women were not deserving of being called nappy-headed hos, we were silently suggesting that there are women who are. While it’s easy to proclaim in hindsight ‘no, no, that’s not what we meant’, history bears this out.